To prepare chutney: In a large saucepan, heat 1 ½ teaspoons vegetable oil over medium heat. Sauté onion, celery and carrots until soft, about 6 minutes. Add apples and cook for 5 more minutes. Add vinegar, apple juice, brown sugar and ginger. Cook for 30 minutes. Season pork chops with salt and pepper. In a large sauté pan, heat 1 tablespoon vegetable oil over medium heat. Sear pork chops until golden brown, about 2 minutes per side. 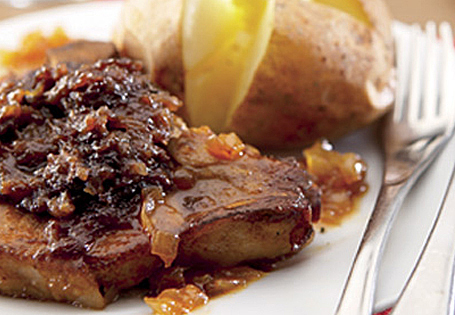 Transfer pork chops to a roasting pan and top evenly with the chutney. Toss potatoes in remaining 1 ½ teaspoons of vegetable oil. Arrange potatoes around pork chops. Cook in oven for 45 minutes.